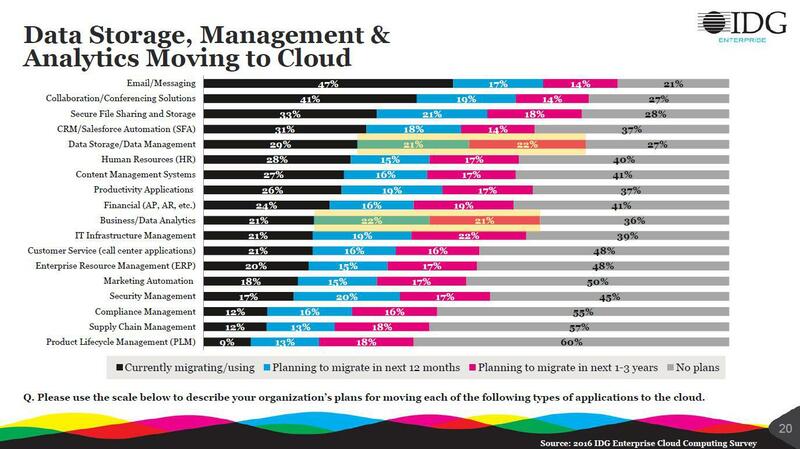 Despite the massive cloud migration movement, most data still live on local file shares. In a recent report, IDG states that only 33% of secure file sharing and storage data has been migrated to the cloud. Most interestingly, the surveyed organizations collectively plan to migrate another 39% of that data in the next 3 years but have no plans to migrate the remaining 28% of their data. They go on to quote similar statistics for other data types but the conclusions are the same, data will be split between cloud and on-premise locations for the foreseeable future. There are a variety of reasons for this segmentation. For example, productivity and profit may drive some file shares toward cloud services, while others remain on-premise because of concerns with security, control and trust. This means that increasing bandwidth will not be enough to guarantee total cloud adoption. As a result, there are three levels of file share migration that present enterprises with a salient question: How much cloud is right for my business data? In other words, they are wondering about finding the right compromise between the security, control and compliance of keeping file shares on-premise vs the productivity and potential cost savings of moving them to the cloud with traditional file sync and share products like Dropbox. For example, healthcare and financial organizations may not be able to tolerate the risk of compliance violations associated with off-premise storage services like public clouds. Instead, they’ll sacrifice the potential productivity gains and cost savings of cloud migration in exchange for the security, control and compliance of their on-premise infrastructure. This level 1 or on-premise migration usually requires a VPN for secure remote access. For a level 2 migration, data will be synchronized between file shares and cloud storage. For most solutions, this is the minimum migration that will support remote access. In this case, file servers are retired or non-existent and the data exists only in the cloud. A business might choose this level of migration to avoid the costs of purchasing and managing on-premise file servers. So, the challenge for file share migration is that you basically have to choose between the security, control and compliance of a level 1 migration and the potential cost reductions and increased productivity of levels 2 and 3. CentreStack virtually eliminates that tradeoff by providing full support for all three levels of migration while including the highest levels of security and utility at each level. The most interesting example occurs with level 1 migrations. With CentreStack, you can combine the security of a VPN with the remote access and collaboration features of Dropbox without migrating file shares to the cloud. This use case is overlooked by standard file sync and share offerings which assume that all data will eventually end up in the cloud (Level 3 migration). Instead, CentreStack acts as proxy to the existing file shares without replicating data to the cloud while providing users with ALL the access and collaboration features they would expect from cloud-based file sharing. In other words, CentreStack makes the file server look like a private cloud without actually touching it. Even though CentreStack can provide easy remote access and collaboration without cloud migration, some enterprises may still prefer having a second copy of their data in the cloud. Unlike other platforms, CentreStack maintains synchronization of NTFS permissions and Active Directory identities between file shares and cloud storage. CentreStack offers the ability to migrate existing Windows security and users before retiring file servers. Or you can create users and permissions from scratch if no file server existed to begin with. These solutions offer enterprises the option to stop their migration at any level and still get all the security of a Windows file server combined with the productivity of file sync and share products like Dropbox, OneDrive and Google Drive. One of CentreStack’s strengths is its ability to provide the same familiar user experience for all three migration levels. Offline access with the ability to check files in and out. This simple, familiar experience has the added benefit of minimizing support and training costs. To learn more, contact us for a demo or sign up as a partner.